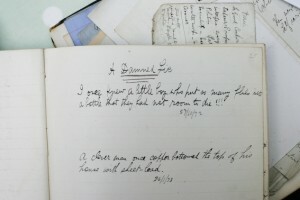 Dracula author, Bram Stoker died in London in April 1912, but an undiscovered diary shows his early years in Ireland had a profound influence on his writing. Listen to Dacre Stoker talk about the journal below. He has been described as “one of the least known authors of one of the best known books ever written”. To mark the centenary of Bram Stoker’s death in April 1912, great grand-nephew Dacre Stoker will publish ‘The Lost Journal of Bram Stoker: The Dublin Years’, a hitherto forgotten diary of Stoker’s personal writings. The journal reveals first-hand the real Bram Stoker – a man with a witty sense of humour, a great social awareness and a fledgling writer, who had leanings towards romantic prose – a genre not traditionally associated with the creator of arguably the most gruesome and ghastly literary character ever. Greystones – 3 August, 1871. The Lost Journal is grouped into themes – humour, Stoker’s friends and acquaintances, street life in Dublin, family background and what Dacre Stoker calls “en route to ‘Dracula’”. Another early entry, dated 27 October, 1872 lays the foundation for the character of Renfield in Dracula. In it, Stoker describes an encounter with a little boy “who put so many flies into a bottle that they had not room to die.” Although ‘Dracula’ was not published until 1897, remarkably this diary entry of 25 years earlier found its way into the novel, providing yet further evidence of Stoker’s lifelong obsession with prolific note-taking and research. One undated diary entry refers to a trip to Collooney, Co. Sligo, which Stoker describes as the “most unbusy place in Ireland”. In the same town, he overhears some disparaging remarks made by a “peasant” about one of the political parties of the time. “They do go round an’ round an’ round an’ round, jist for all the world like a dog lookin’ for the head of his bed.” This, together with numerous other entries, reveals Stoker’s precision and keen ear for recreating the local dialect. The journal also gives us a good appreciation for Stoker as a social commentator. Many of the entries record Dubliners going about their daily lives, such as the old woman who mistook a cabman’s shelter at the Rotunda for the tram terminus at Sackville Street (now O’Connell Street). Refusing to leave, she stayed for two hours, “taking the admonitions of the jarvie for chaff”. On Dublin’s Castle Street, Stoker eavesdrops on a conversation between two women, recounting a neighbour’s tale of domestic violence, a relatively common social problem of Victorian Dublin. “This woman, she hardly had the good breakfast into her body till she gets a kick in the stummick that sent it all up again.” Perhaps Stoker’s sense of drama, stemming from his work as a theatre critic for the ‘Dublin Evening Mail’, led him to record these fascinating snippets of social history. Co-annotated by world-renowned ‘Dracula’ scholar, Professor Elizabeth Miller, ‘The Lost Journal’ lay undiscovered in the attic of Stoker’s great grandson, Noel Dobbs on the Isle of Wight. It only recently came to light when Dacre Stoker was researching his 2009 novel ‘Dracula: The Un-Dead’, the only official sequel to ‘Dracula’. It contains 160 pages and 310 individual diary entries in Stoker’s own handwriting, covering the period from 1871 to 1881. In fact, one of the biggest challenges of bringing the journal to life was the struggle to decipher Stoker’s handwriting. Dacre Stoker describes himself and Professor Miller as “forensic explorers” in their quest to piece together the hundreds of notations, which comprise the notebook. ‘The Lost Journal of Bram Stoker: The Dublin Years’ is written by Dacre Stoker and Prof Elizabeth Miller and will be published by Robson Press on 8 March, 2012, priced at STG£18.99. 30, Kildare Street – This was Stoker’s first independent address after moving from home. 7, St. Stephen’s Green – lived above the ground floor grocery and wine shop in 1877. St Ann’s Church, Dawson Street – wedding of Bram Stoker and Florence Balcombe in 1878. Start your digital journey towards better customer engagement and closer client relationships.